On the guitar, the D form is unique in that it’s the only CAGED form that isn’t rooted to either the 6th or 5th string. Instead, its root is on the 4th string. This form is awkward to finger and technically isn’t a barre chord. As with some of the other CAGED forms, you don’t usually use it in the same way that it appears in the open position. You may prefer to finger the D form in a different way. For instance, some guitar players swap their 2nd and 3rd fingers. Others can barre the 1st and 3rd strings with their 3rd finger and fret the note on the 2nd string with their 4th finger. Feel free to experiment, but remember, you don’t need to play this whole chord perfectly. 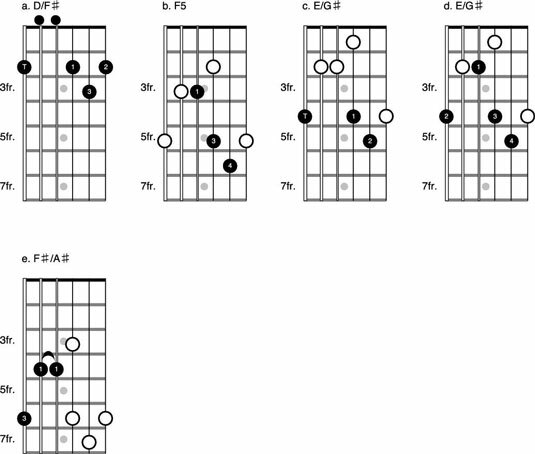 You can play the full D form arpeggio pattern. Notice that you have a lot more to work with here than what’s present in the small D form. Three additional chord members on strings 4 through 6 fit with this form. Play it as a scale. The D form is used less often than the other CAGED forms, but it still has the potential to form some unique and useable chord voicings, as you can see here. A is a very common version of an open D that puts the 3rd, Fs, in the bass at the 2nd fret of the 6th string. It’s often fingered as a regular D chord with the thumb wrapped around the neck to fret the 6th string. You hear variations of this shape used in “Free Bird” by Lynyrd Skynyrd. B is a power chord with the root on the 4th string. This F5 is used in “All the Small Things” by Blink 182. C is an E/Gs and fits into both a D form and a C form (see the earlier section “Using the C Form”). It’s used in “Tears in Heaven” by Eric Clapton. You can finger this shape with your first three fingers or try using your thumb, as I illustrate in the figure. D is another variation on E/Gs. This one occurs in “Crash into Me” by Dave Matthews Band. E is an Fs/As and is used in “Snow (Hey Oh)” by Red Hot Chili Peppers. The triangular D shape on strings 1 through 3 is often moved around the guitar neck. This shape fits into both the D form and the C form. You trace the root back to either the 4th or 5th string by using these forms.